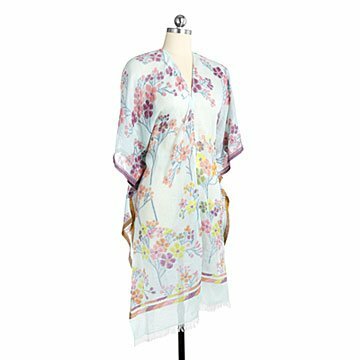 This light, airy, cotton robe, covered with hand-embroidered blossoms, feels like wearing a summer cloud. Slip on on this gauzy, mid-length kimono robe and feel like you’re wearing a cloud—if clouds had flowers. (They should, right?) Hand-embroidered blossoms float dreamily across the semi-translucent, 100% cotton fabric, whispering, “Relax, it’s summer.” Elegant, woven edging in contrasting colors adds a touch of regal sophistication. It almost makes you want to order a bowl of peeled grapes and someone to stand over you waving a big fan as you lounge. Or to give it to a deserving mother, sister, or new mom—and you bring the grapes. Handmade in India by a women’s cooperative.